Call the FEMA helpline at 800-621-3362 or TTY 800-462-7585 if you have questions about how to file an appeal, the status of your claim, or other disaster-related issues. If you registered with FEMA and are still awaiting a final settlement from your insurance company, be sure to update FEMA once your insurance claim is settled. You may still be eligible for grant assistance if your insurance didn’t cover all of your essential disaster-related needs. Keep FEMA updated with your most current mailing address and phone numbers. If you get a letter from FEMA saying you’re ineligible, read it carefully. You may simply need to provide additional information or documentation and the letter will explain how to follow up. Again, call the helpline if you have questions. If you have questions about your application for a disaster loan from SBA, call 800-659-2955 or TTY 800-877-8339 or send an email to DisasterCustomerService@sba.gov. FEMA’s federal partners played a vital role in helping survivors of the January tornadoes in South Mississippi. HUD representatives confirmed that working with FEMA and other federal partners ensures a better understanding of needs that helps guide services needed for recovery. HUD and SBA assisted survivors at disaster recovery centers and served on the Mississippi Unified Housing Task Force, which coordinated and leveraged resources from local, state, federal and voluntary agencies to address unmet housing needs of displaced survivors. "In Mississippi we must leverage all assets to help our disaster survivors not only immediately after an event but in the months and years after as our communities rebuild," said MEMA Executive Director Lee Smithson. "HUD and SBA are integral partners in restoring our communities to normalcy and I don't know what we would do without them." 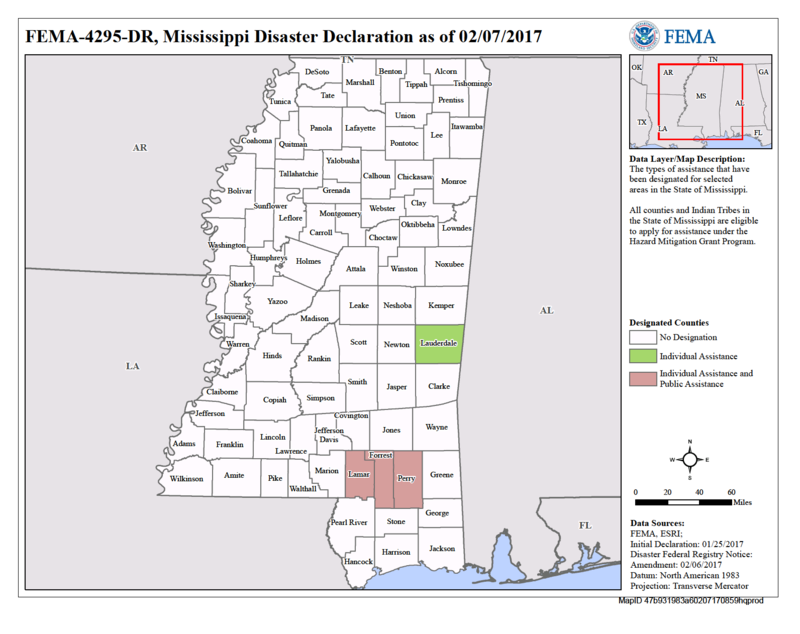 For more information on Mississippi’s tornado recovery, visit the Mississippi Emergency Management Agency site at msema.org. Follow MEMA on Facebook facebok.com/msemaorg and on Twitter @msema. For information on local long-term community recovery efforts, visit www.R3SM.org.